This beautifully framed item features two of the greatest and most popular Major Leaguers of all time, Stan "The Man" Musial and Ted Williams. 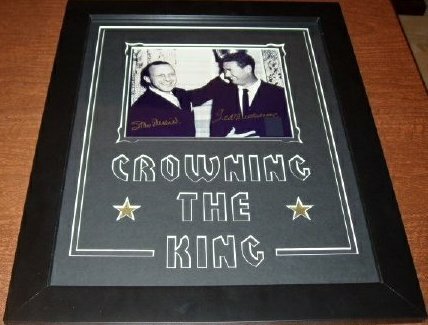 It has been hand signed by both Hall of Famers, and professionally framed and matted with "Crowning the King" in the mat. It includes a Certificate of Authenticity from Green Diamond, and will look great displayed in any home or office!